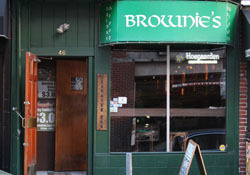 Brownie's is one of the few true "Hole in the wall" bars in Old City. You can smoke, drink, and watch your favorite local team play. A friendly staff and regular patrons make it feel like home. 14 Beers on Tap from breweries such as Dogfish Head, Yuengling, PBC, and other local favorites!